Today is the first day of October. If you are using The Cycle system from Time Management for System Administrators don't forget to review your life- and long-term goals and do any other monthly routines. Being the first of the month, sites running mailing list software like Mailman will be sending you reminder notices about which mailing lists you are subscribed. Take this time to pick a few lists to remove yourself from. What high-volume list have you been filtering off to a folder and ignoring? What low-volume list did you join ages ago and aren't getting any value from? What technology mailing list are you on for sentimental reasons even though you no longer use that technology? Today is a good day to unsubscribe from these mailing lists. Both The Practice of System and Network Administration and Time Management for System Administrators can be read on-line by subscribers of O'Reilly's Safari Books Online service. As a system administrator I spend a lot of time thinking about infrastructure. Good, solid, infrastructure saves money, but is sometimes inflexible. On the other hand, flexibility makes infrastructure more useful and broadens its appeal. Watching this machine work is a delight. I've been lucky enough to see it three times. 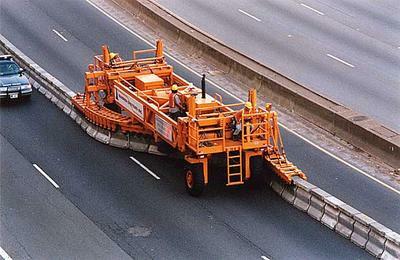 It only takes 20 minutes to move a mile of barrier so seeing it in action has a low probability. I have to imagine the person that first proposed creating this device was thought to be crazy. I suppose they had to fight their way through nay-sayers in their company until someone believed them. However, now that the machine exists it just seems like a natual thing to do. Every time I see this machine I think it makes a great analogy for IT projects. The more audacious an IT project is, the more crazy it looks. After it is complete and people are benefitting from it everyone thinks it is obvious.